Can a dark mystery bring two people together, or will truth rip them apart? Finley Aims is a new student, she is a blank slate based on how she was raised in an isolated environment with her parents, who are bright research scientists. She tries to navigate her life after being pulled from the only place she ever knew, struggling with an extreme stutter from shyness. Everything gets worse when the town’s ‘It’ boy tries to take advantage. But the boy who was labeled a freak, a boy she was warned countless times about, saves her. The most unusual friendship between two people who don’t want, or know how to make friends begins, and maybe even more between them. Soon a dark mystery erupts. Finley and Harry begin an intense emotional journey, taking on Harry’s deceased father’s scavenger hunt that he left behind for his son. The truth is going to come out. Will Harry Styles be able to handle it? 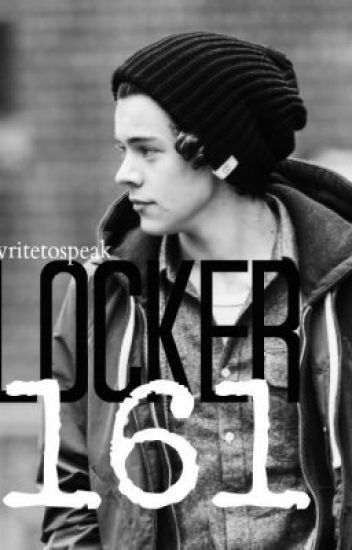 It will all begin with locker 161. If you're looking for a unique story about Harry Styles, this is the one for you. Also, the trailer, that was made by SaraIssa12, you see Hayden Panettiere as Finley. We talked and weren't too sure who to use for the trailer. That's not 100% how I picture her so just go by your own judgement. I hope you read this story! Lola was so in love with love. She read every book on it but never felt that spark. She watched every movie, read every poem, her heart was full and ready to love someone but she couldn't find the right fit. Until she met the most unattainable man- Harry Styles. He's not some womanizer but he can't make connections, he is battling a lot more than he puts out. There are secrets in his heart that even his best friends don't know. An intense, emotional friendship grows. When everything crashes and burns, can she save his heart and her own? Find out! When Harry Styles goes to the charming town of Sumter in South Carolina, he expects a simple vacation. But when a young woman, the towns most wanted, craved woman, catches his eye, he can't just go. Everything about her, from her dreads to her lifestyle intrigues him. To his surprised the girl with dreads wants nothing to do with him. He comes to the understanding that this won't be easy, but he wants to put in the time to build a real, true, relationship with her. Can Harry Styles work his way into her heart? Can he get her first kiss? Her first hug or hold her hand? Will she give him all of herself? This is not your typical fanfiction. Unlike most, Harry doesn't blink and the girl will magically fall in love with him. It takes time. It's far from love at first sight. If you want a fanfiction that is as close to a real relationship as can be, this story is for you. This is the type of story to read if you like to watch love bloom, and not rush to get to the chase. Lola has been through the ringer with Harry. Now that they have one another what comes next? This is the story about Lola’s turn to struggle with love. Harry Styles has become the hopeless romantic… what will come of Lola and their relationship? Find out! When Harry Styles' mom sends him away to Florida because of his disrespectful behavior he only expected to be there a couple days, until he realized his mom was being serious and he's staying there for good, until his behavior changes. He just wants to go back to Holmes Chapel, but he can't do that if he doesn't change. So what happens when he meets a girl complete opposite of him? Will opposites attract? Or will they completely backfire? Harry just wants to leave the states, but not before a special girl changes him. Not before one special girl fixes him. Skylar Moore just graduated high school and is expecting to spend her summer vacation relaxing and having fun with friends. What if her mum tells Skylar that she is to be working during weekdays for the rest of the summer? What if Skylar finds out the she is working with the most avoidable and mysterious person from her school, Harry Styles? Everybody at school was scared of Harry after a mysterious event that happened a year ago. After that event Harry changed his personality and his looks to resemble a bad boy and nobody knows why. Nobody dares to talk to him since that event and he doesn't talk to anyone except his good mate, Liam Payne. However, Skylar is not afraid of Harry Styles. Instead, she is rather curious of him. Skylar now is very eager to know the truth about the mysterious Harry but first she needs to gain his trust. Will Skylar and Harry befriend? Will Skylar find out the truth? © 2014 fadoraharry_ All rights reserved. It started with a locker. His father’s treasure hunt brought him down a road he never wanted to see. We left off with Harry finding the terrible news of his father, walking away from his grave. We were left wondering, could he move on? Could Harry forgive Anne, could she really keep her word and try to make a relationship with him? Above all, could he forgive himself, and understand his father’s death truly wasn’t his fault? Could he handle it? Finley Aims never expected to fall for brooding artist, the boy with baggage so heavy she didn’t know if she could really lift anymore. Now that she fell wholeheartedly, she never wanted to let him go. Harry struggles, and struggles. The world weighs more and more on his shoulders, he looks to Finley, how loves him endlessly, and is fearful. He falls, farther and farther till his world just crumbles. When things fall apart, Finley travels north with her family, working on a new research study. She is coping, hopeful for a future, when she gets a letter. The hunt is on to discover Harry’s whereabouts. Harry is following in his father’s footsteps; he is leaving a treasure hunt to the truth. Will Harry be alive at the end of it? Or will another Styles man fall into the trap his own mind set? Finley will embark on the hunt of her life, to not only search for Harry, but search for his heart, his happiness again. Thank you a million to SaraIssa12 for making my trailer!!! A short story about when your mind rebels against your heart. Josephine Marie Laken is a girl who just wants to be the perfect daughter to her parents. She craves to bring home perfect grades, even though it stresses her out to no ends. When she agrees to tutor a student in History as a favor to Mr. Harbors, that will also help raise her grade, she didn't know just what she was getting into. And she wondered; if I did know how everything would go from there on, would I have changed anything? Or would I have walked straight down the road of ruins anyways? Harry and Lola have a love story like no other. Now they’re on their final story, and the biggest secret of all that has been haunting Harry is revealed. They have fallen completely and totally apart. Fights, distance, tears all surround them. Is their love what they vowed it to be? Hopelessly passionate? Or were they never the hopeless romantics they believed?